The following sites, developed for various reasons, all provide valuable wild pollinator habitat. 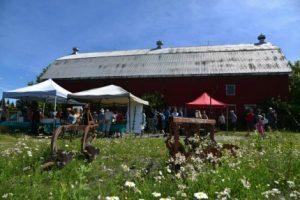 Visit them to see how people are supporting pollinators throughout the Outaouais-Ontario East region. Volunteer Carol MacLeod takes care of pollinator beds on the Monk Street side of this seniors’ centre in the Glebe. Hank and Vera Jones have tuned the front garden of their half-acre lot into a pollinator garden. In addition to perennials, it contains many fruit and nut trees. Their backyard is CWF-certified wildlife habitat. They also grow vegetables and salad greens in portable tables and enjoy foraging produce from the trees. Hank recalls: “Launched in 2008, the APG started by “rewilding” the site – letting what was already there show its face; over a hundred plants did so. Ottawa By-Law did not approve. We spent the first year arguing that the city was already asking for such places, but their rules contradicted. We were finally vindicated. However, this contradiction has emerged repeatedly for others in the region seeking the same emancipation – victoriously in every case as I can recall. The native plant demonstration gardens at Beaux Arbres are alive with a wide variety of flowers and pollinators throughout the season. 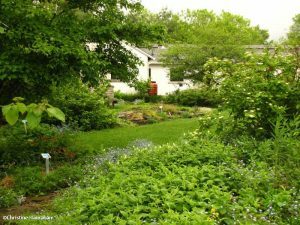 See over ten different types of plantings in diverse sites, including a woodland garden, rock garden, willow grove, dye garden, prairie meadow, and more. 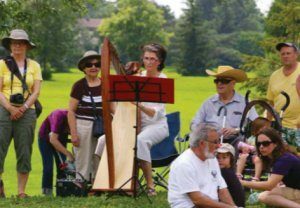 Residents of Old Ottawa South are turning a strip of mowed grass into an urban meadow and forest filled with a diversity of trees, shrubs, grasses, and flowers that support pollinators and other beneficial insects. The CWF includes a pollinator bed among its many demonstration gardens, complete with a plant list. An interactive map on its web site allows you to click on each plant for photos and more information. The Canadian Wildlife Federation (CWF), in partnership with the National Capital Commission, Hydro One, and Lanark County, is testing whether the creation of native meadows along roadsides and rights‐of‐way can successfully control Wild Parsnip, while restoring Monarch butterfly habitat and reducing management costs. Right‐of‐way corridors that are restored for Monarch butterflies will be used as a nursery for caterpillars, fuel for the long journey of the adults, and rest stops along the way. They will also be beautiful sites to behold for Monarch lovers across the province. The Fletcher Wildlife Garden features several areas that particularly attract pollinators. Flutter and Buzz Pollinator Patch is in a city park next to a playground and Adrienne Clarkson Elementary School. 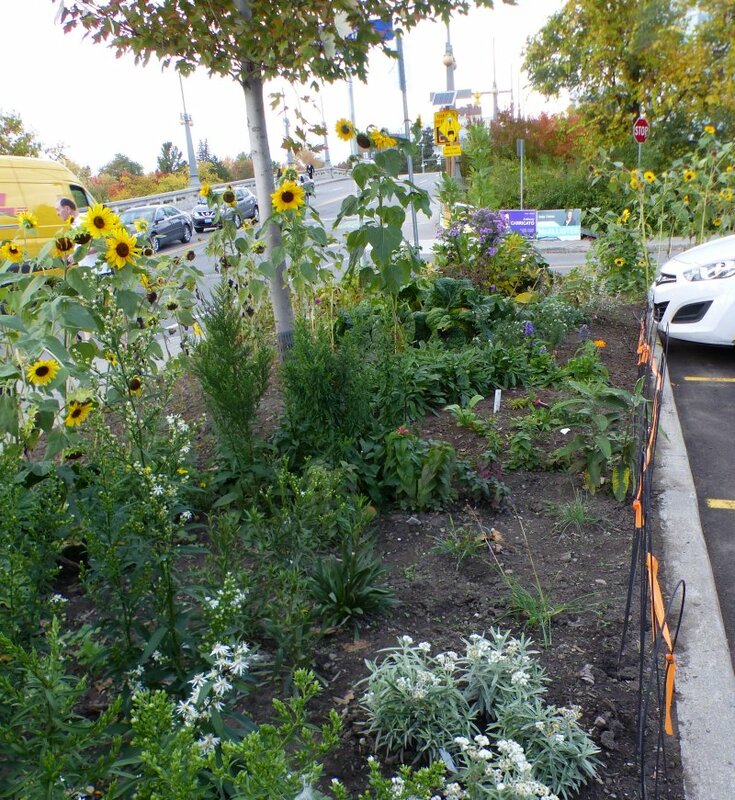 This pollinator garden was started and is maintained by residents in the surrounding neighbourhood. It provides a learning site for the adjacent school to promote understanding, conservation and appreciation of nature. Volunteers remove Wild Parsnip by hand, to save all the other roadside plants for pollinators. Friends of Lanark County are using the province’s Adopt-a-Road program to prevent roadside spraying of herbicides to control Wild Parsnip. Concerned over the health of native insects and anxious to preserve wildflowers along local roads, this group of “mostly seniors” is manually removing Wild Parsnip and planting native species both purchased and donated. They are very disturbed by the increase in roadside spraying to deal with invasives and want to reach out and educate others about taking a more cautious and reasoned approach. 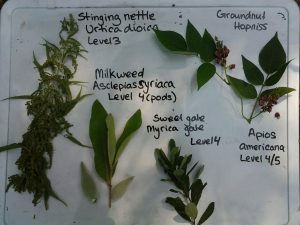 Throughout the seasons, flowering flora (plants and shrubs) are marked with informational signage that provides details on the species and its ecological, medicinal and edible properties. In May 2018, Petrie Island became a registered Monarch waystation. 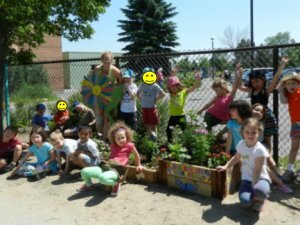 This garden was created through a partnership between the Glebe Community Association Parks Committee, Glebe Collegiate’s environmental club, and the Ontario Nature Youth Council. 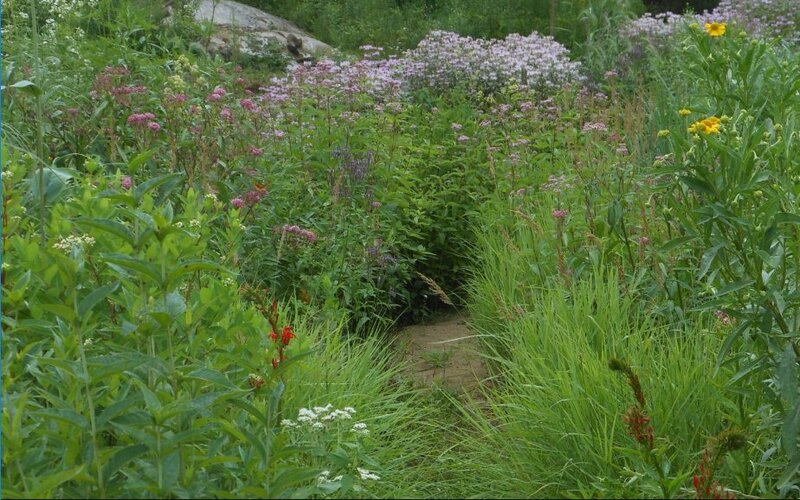 It contains a variety of native perennials and a bee bath. “Started in 2012, the Just Food Farm is where people and projects come together to model and inspire small-scale, viable agriculture businesses and initiatives in the Ottawa region.” Weedy fields and edges provide habitat for native pollinators and the farm created a pollinator hotel at a recent workshop. 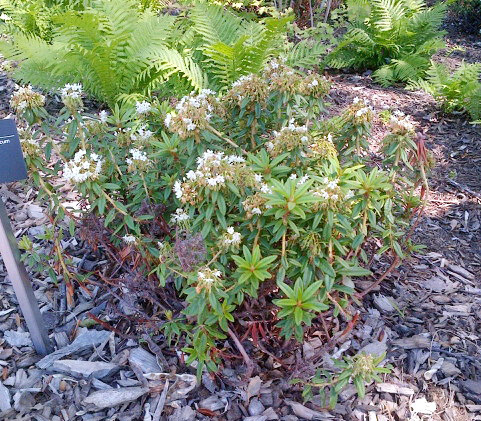 You’ll find Labrador Tea growing in the boreal forest part of this garden. This outdoor space at the CMN features native trees, shrubs, and wildflowers found in Canada’s boreal forest, Arctic tundra, and prairie grasslands. 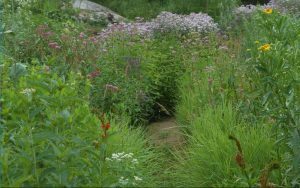 Although not created for pollinators, the prairie garden, in particular, attracts a number of bees, butterflies, flies, and other insects. Pollinators are attracted to the exhibit of local floral plants in the civic gardens next to the Horticulture Building. Started many years ago by the library’s custodian, this garden is maintained by Green Dreamers, who also take care of a number of street beds on Bank Street in Old Ottawa South. 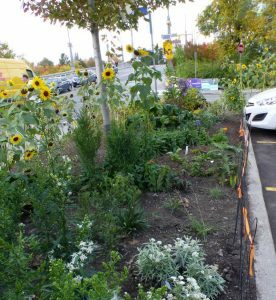 In 2018, the Dreamers planted a number of native wildflowers including Pearly Everlasting (front of photo), New England Asters, Joe-Pye Weed, bergamot, and others, in the large garden bed between the sidewalk and parking lot next to Sunnyside branch of the Ottawa Public Library. 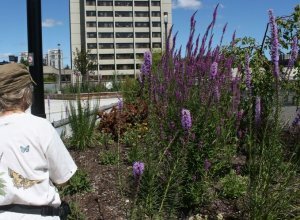 This garden includes both vegetable and pollinator beds, with a variety of species that are both native to Ontario and pollinator-friendly. It is maintained by student and staff volunteers. This corner of Beechwood Cemetery is often filled with children’s voices as well as the sounds of nature. Located at the corner of Beechwood Cemetery, this natural area is maintained by volunteers, including many school children, under the leadership of science teacher Michael Léveillé. Many species of wild pollinators have been observed there. The 19th-century walled garden at Maplelawn is a national historic site. Its colourful all-season displays of perennials include many pollinator favourites. 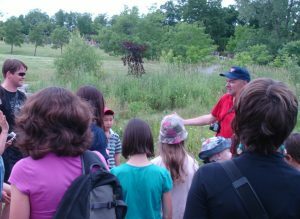 The community gets a beautiful green space that is an asset to the neighbourhood, invites people to walk its paths, and provides an opportunity for learning about the environment and connecting with nature. Hydro One gets a corridor that won’t require costly maintenance to keep the land clear beneath the power lines. 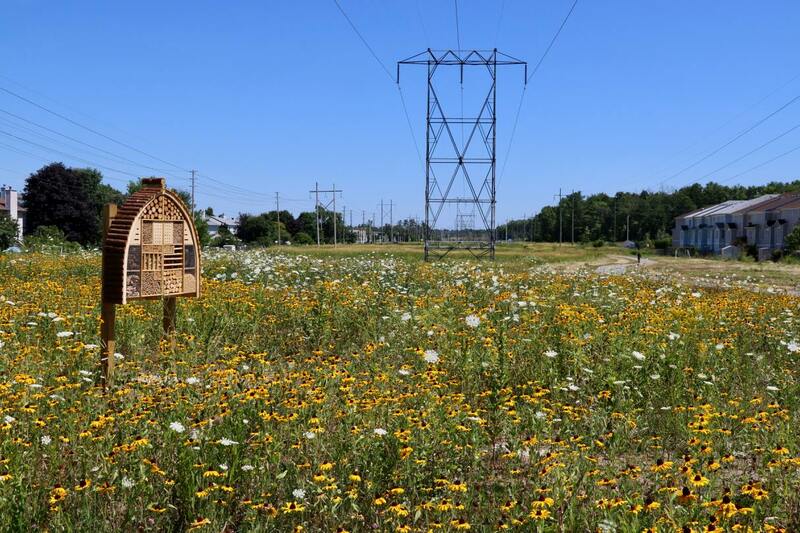 In place of a corridor filled with invasive species, Nature gets a meadow of native plants for pollinators that supports bees, butterflies, other insects, birds, and humans. A great model for other communities! For more about this project, see OSC projects, and scroll down to Morgan’s Grant. 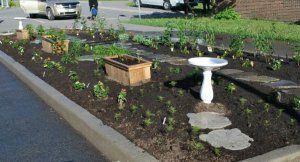 As part of a Monarch Teachers’ Network (MTN) project to establish Monarch Waystations at schools across the city, this garden was started in 2012-13. It’s very small garden, under 200 square feet, but contains water features, a central path, small raised beds in the larger area, many, many colourful flowers, and lots of love. As part of a Monarch Teachers’ Network project to establish Monarch Waystations at schools across the city, this garden was started in 2012-13. Although this garden started modestly, at less than 200 square feet, it has grown as students and teachers use and appreciate it. In 2018, a teacher who was just learning about gardening and native plants contacted the Fletcher Wildlife Garden, which followed up with a site visit, advice, and the addition of more plants. The garden is arranged in raised boxes that contain a number of Common Milkweed plants. 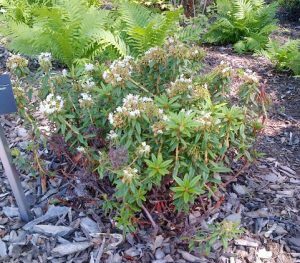 In 2018, students added Butterfly Weed, Wild Bergamot, Beebalm, Columbine, Lance-leaved Coreopsis, and False Sunflower. As part of a Monarch Teachers’ Network (MTN) project to establish Monarch Waystations at schools across the city, this garden was started in 2012-13. 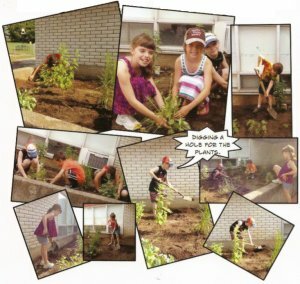 The garden is a raised bed of about 300 square feet, next to the Pakenham Public School, where it has good drainage and gets a lot of light. Because it’s in a city park, many people were involved and “it was complicated.” The garden is planted in a circle, about 38 feet in diameter for a total of about 300 square feet. Residents, local schools, city staff, and of course teachers from the MTN were all involved in planning, planting, and maintenance. 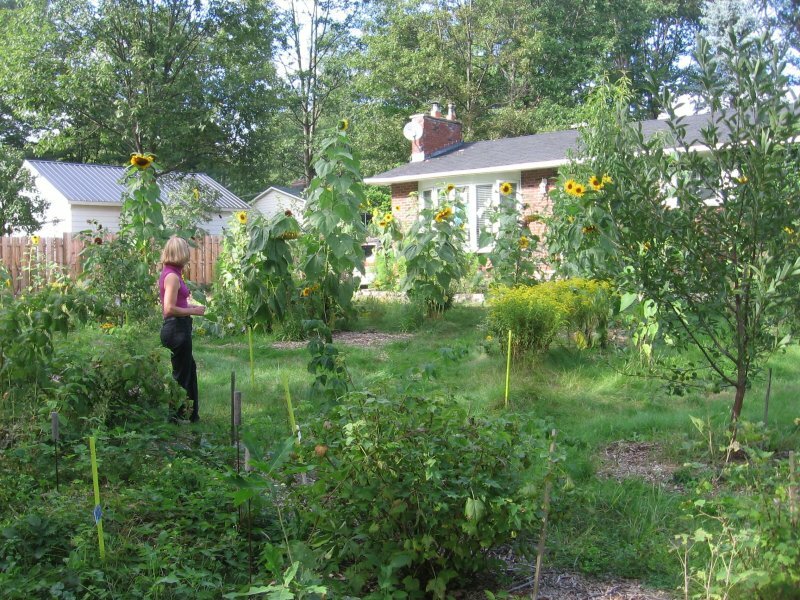 Local schools have been inspired by this garden to create their own garden or waystation. 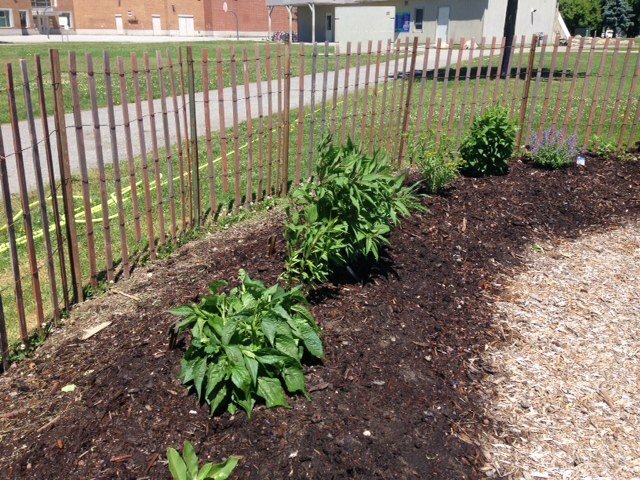 As part of a Monarch Teachers’ Network (MTN) project to establish Monarch Waystations at schools across the city, this garden was started in 2012-13. 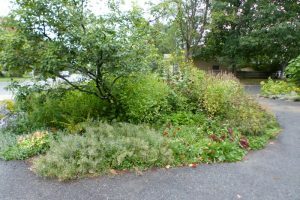 It’s small – about 300 square feet in raised boxes – but was planted with 3 milkweed species plus annual nectar flowers like zinnia, and native perennials like Beebalm and Joe-Pye Weed. Children in the child care and kindergarten groups helped build and decorate the boxes, plant, and water. 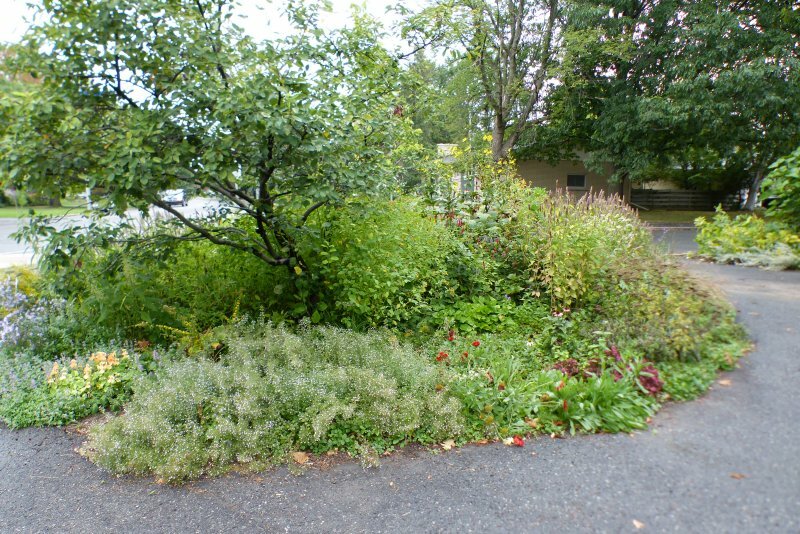 Last spring, Berit Erickson turned a front yard, on a busy urban corner, into a pollinator garden. Because so many people stop by while she is working in the garden, she created a brochure full of great tips and information about what she is doing. Berit kindly shared a copy with us. 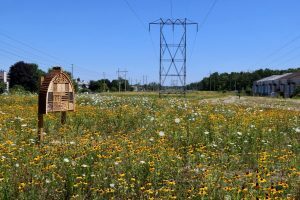 Established in 2015, the Trinity Presbyterian pollinator garden in Kanata is home to native plants that provide nectar and pollen to beneficial insects and birds. The church’s youth group was inspired to start the garden and led the design and implementation with the support of the congregation. 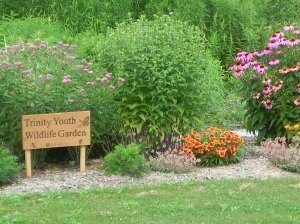 The youth group and the congregation maintain this pollinator garden.